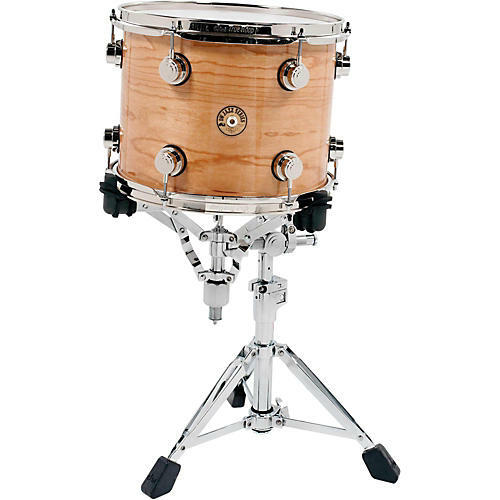 A rack tom mounted in a snare basket is more common than ever and that is why DW offers the 000 Series tom/snare stand. The beefy 9399 specializes in securely cradling rack toms by offering increased isolation and resonance via specially-designed Neoprene pads. These soft pads act as a cushion between the baskets crutch tips and the drums counter hoop, while gripping tightly for stable, solid play. The stand also offers a patented removable, offset basket for easy positioning and quick snare changes. The larger footprint is courtesy of a Mega-Tripod base that gives the 9399 the largest footprint of any DW snare stand. The result is a heavy-duty, road-worthy stand that gently supports rack toms and snare drums like never before. Drum Workshop, Inc. guarantees that DW Collector's SeriesÂ® Drums are free of material and workmanship defects for a period of six (6) years from the original purchase date. Drum Workshop will repair or replace defective products free of charge to the original purchaser upon delivery of the product to an authorized DW Drums dealer. Proof of purchase and status as the original purchaser are required for warranty coverage. DW's maximum liability pursuant to this warranty is limted to the monetary value of the product that is the subject of the warranty claim. This is a summary only; please see the actual limited warranty for additional terms and conditions. For a period of five years from the date of purchase, Drum Workshop, Inc. guarantees the original owner, when presented with proof of purchase, that all 9000, 5000 and 7000 Series Bass Drum Pedal cast parts are free of material and manufacturing defects. This warranty is limited to cast parts only; such as the base casting, footboard, beater hub, sprocket, heel and cam casting. This warranty does not include moving parts; such as the spring assembly, beater ball, radius rod, hex shaft, ball bearings, etc. If under normal playing conditions parts covered in this limited five year warranty fail, they will be replaced at no charge. Return the pedal to your authorized DW dealer or, if there is not a dealer in your area, contact DW direct. DO NOT send pedal to DW without first receiving a Return Authorization Number. Shipping charges to DW will be paid by the consumer. DW's maximum liability pursuant to this warranty is limited to the monetary value of the product that is the subject of the warranty claim. This is a summary only; please see the actual limited warranty for additional terms and conditions.